A concussion causes injury in two places, since the brain strikes the inside of the skull first at the point of impact and then again on the opposite side as it "rebounds" away from the impact site. If the head rotates at the time of impact there can also be damage to the axons that connect the brain's gray matter to the white matter below. Click on the zoom icon for details. A concussion is an injury to the brain that causes a brief disruption in mental status (such as confusion, disorientation, and memory loss). A concussion is not life-threatening, although repeated concussions may have the potential to cause long-term damage. Most concussions don’t need medical treatment, but anyone suspected of having a concussion needs to be evaluated to determine the extent of the injury and be sure they have not suffered a more serious injury such as a skull fracture or bleeding in the brain. The temporary change in mental status that defines a concussion is not caused by structural damage to the brain. It’s caused by a disruption in the chemicals that carry messages from one part of the brain to another, or by temporary damage to the long white matter tracts that connect different parts of the cortex (like wires connecting one area to another). Loss of consciousness, when it occurs, is caused by the disruption of the long tracts that reach down into the brainstem. 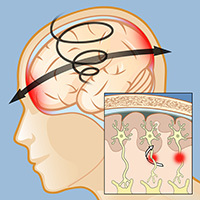 Concussions are often caused by a blow to the head (such as in a fall or an accident), but they can also happen without direct impact – a forceful movement of the head can cause a concussion when the brain moves within the skull (such as a rapid, forceful acceleration or deceleration). The force of the impact or sudden movement causes the brain to strike the inside of the skull and then rebound against the other side. An injury in which the brain rotates is more likely to cause a concussion than side-to-side or front-to-back movement. The rotational force may cause the axons that connect the gray matter of the cortex to the white matter below it to twist, tear, or break, a conditional called diffuse axonal injury (DAI). Reviewed by: Kenneth Perrine, Ph.D.